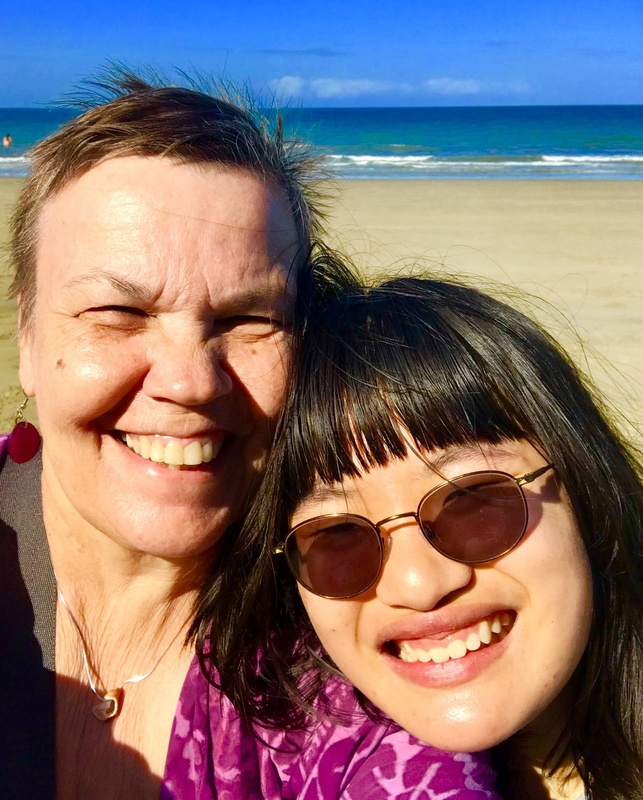 Updates and stories about my daughter from China who came home with challenges described in letters—PDD-NOS (on the autism spectrum), ADHD and RAD (Reactive Attachment Disorder). Her learning curve has been steep and therapy is a way of life. School and social interactions are a challenge. Making art is a way of life. So is a vivid imagination. So much change, so fast, none of it bad but all of it pushing over the edges of comfort. I start and scribble and then leave it. And then, change again, making what I scribbled about before irrelevant. Compassion, especially for myself, is my current practice. I need to go to the gym, pamper myself some, we need to go to the movies and indulge in ice cream. I can understand Julia’s ups and downs; I need to understand my own. Julia, by the way, has good and bad days, needs to check every day that we are taking all of her books and stuffed toys, and that she will finish the school year at West High, but she is doing pretty splendidly. Spring break. Tuesday through Saturday. Boston environs. Pictures now, reflections later. First morning in Boston and first Dunkin’ Donut. Not at all what the house looks like today, but my favorite picture of my home. House on sale today. The listing. The House: Staged. Stripped of it finery. My finery. Even the periwinkle walls of my bedroom are bleached white. Adorned with ersatz tchotchkes and fake ferns. Upstairs hall echos when I call up to Julia in the morning. The ethos of the house is a disturbing dream of a home I have abandoned but not left. Dali or Esher-like? Curiosity. Perhaps that is the theme for the month, maybe the year. In Mare Chapman‘s class last fall, (wonderful teacher, by the way) a discussion about feeling ‘less than’ led me to tell the story of my brother challenging my ability to do a task because I was a woman. One of my classmates asked what I would say to my brother today if he said the same thing to me today and I was silent. When I admitted that I had no idea what to say, she offered, “I’d ask, ‘Why would you think that?’” Her answer/question stunned me because it was so simple and yet, so far from my grasp. We have been! If there is one person in my circle who has not heard of Marie Kondo, Japanese tidying diva, you need to check out her Netflix show and her website. https://blog.konmari.com. Wait, let me walk that back. If you house (and your life) is orderly and tidy, if you have only what you need and are not burdened by the excesses you carry, ignore this goddess. But for us . . .
More Aboriginal Art that I did not buy. Next time!! When I go to open the journal/blog file and it is not in the “most recent” list, I know for sure it has been too long. My fingers ache with my scribbling deficiency but my head is stuffed with Earth Science facts, easy algebra and a lesson on loving myself from James Baraz. Julia ZhiKuang is 18 years old. What a journey! Unexpected and unimaginable but the very stuff of our family. A very, very happy birthday, my dear girl! Pictures are from our first month as a family and one of Julia’s first selfies to be posted on Instagram. I could hav stayed home all day under covers, sipping tea and staring into the fire. But . . .
We are a young artist on the autism spectrum and her warrior writing mom making family and discovering the world. Home is Wisconsin. We’ve travelled to Italy, England, Alaska, Australia, Maine, Florida, Mexico, California, NYC, Boston and some places in-between. These days we are back home adventuring as a high school sophomore and a pushy mama. Visit awhile, read and comment. Nothing like a good conversation to begin another adventure. Toffee chocolate matzoh with sea salt and pistachios. Never going to buy the commercial ones again. Pizza with procuiltto. Better than pepperoni! View from inside the Doge’s palace.